If you do not want to leave the casino with $2 in your pocket, better stay disciplined and put a limit for yourself. Losing everything on a single bet will definitely not bring you joy from what are you doing. Thus, having a plan to manage your money is the best strategy to win in roulette. It may be a good idea even to leave your credit cards at home and take only the amount of money, which you put aside namely for the playing session. Do not get addicted to the idea of winning at any cost, because this may leave you with no money even for grocery. So be wise and play smart! Keep in mind that you need to wager only money you do not need to live on. When it comes to gambling and managing your bankroll, every player should know when it is time to quit the game! Most players have a limited budget, because everybody needs to meet the demands of life. Thus, it is not wise to throw all your money away on inappropriate bets in the casino. To avoid any possibilities to bankrupt, it would be best to separate your money into two bank accounts. With a separate bankroll, you will have a certain amount of money only for gambling, without being tempted to spend your whole budget on it. 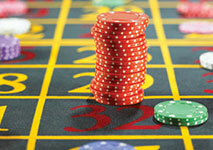 In the gambling bank account, you should put only amounts of money, which you can afford to lose. In fact, the money in the gambling account is your bankroll. If you consider playing other games besides roulette, it would be a smart decision to set aside a different bankroll. The purpose of every player is to generate a winning. But when you are playing a game of chance like roulette, money management is highly recommended. With every bet you place, your bankroll is changing, because of the amount of money you win or lose. Hence, the player always needs to keep track on the profits and losses after every gaming session. There are different strategies for managing your bankroll. Every player has different budget limits and goals, therefore it is hard to outline one ubiquitous method, which is valid for all players. To determine the best way to manage your gambling budget, you need to take into account your personal style and intensity of the game. Every player should be familiar with the difference between bankroll management and betting systems. In a nutshell, bankroll management is related to all the money, which you have set aside for the playing sessions, while the betting system is something different. It is the amount of money, which the player should wager after winning or losing a bet. As it may become clear from the name, this method is valid only for a single session game. The player needs to set a win goal, which corresponds to their individual expectations, but it is also reasonable. The win goal reflects the amount of money, which you want to win during the playing session. In fact, the amount of your bankroll is determined by your win goal. The bankroll should be 5 times higher than the win goal. For example, your win goal for the session is $20, so your bankroll should be $100. This is a good way also to keep your feet on the ground, when setting your goal. If your win goal is $200, but you cannot afford the invest $1000 in your bankroll. Then, this is significant enough that the win goal is a bit higher for your means. Keep in mind that once you reach your win goal, then your playing session is over! Most of the inexperienced players get overexcited when a winning streak occurs, which may lead them to a total loss of everything. Thus, once you reach the goal, it is time to leave the table! Another advantage of this method is that you do not have to pick up a loss limit, since your whole session bankroll is the loss limit. But remember that even if you lose your last cent from the bankroll, the worst thing you can do is to chase your losses. Just give it a break! This is one of the simplest methods to manage your bankroll, since it affects your budget over one single session. The whole idea behind the monthly bankroll management is to plan your gambling budget for the whole month. This should be money, which you can afford to live without. In this case, you should decide the amount of money you are willing to lose for the whole month. The other important aspect is to break down your bankroll into the number of betting sessions you plan. Even though you have already determined a certain amount of money for each session, there are cases when the players exhaust the monthly bankroll in the beginning of the month. Then, you should remember that you need to leave the roulette table, in order to protect yourself from significant losses. Thus, it would be wise to determine a base betting unit in accordance with the bankroll. It is highly recommended that the amount of the betting unit should be between 2% to 5% of the overall budget for the particular betting session. Players should stick to that limit and restrain themselves from the desire to chase their losses. No matter which method you go for, in case you hit the great score, it is a good idea to split the money, which you have won in two. Set aside half of it in your bankroll. This is a guarantee that you will have an overall profit when the betting session ends. The excess you can use to continue with the betting session. By doing so, you ensure that you will not lose what you have won in a day. In case that it is not your lucky day, you need to remember that discipline is everything. After the sum of money, which you have set aside for the particular betting session is over, you need to quit the game. Before you approach the casino, every player should have a plan in case of a bad betting session. That is why versed players always set a loss limit. They recommend that it should not exceed 50% of the initial amount of money, which you have started to play with. For example, you join the table with $100 in your pocket, so the maximum loss limit is $50. This means that you should not play till you give away your last chip, but quit whenever you reach the loss limit. Yet, many players lose control in case of long losing streaks. This can be devastating to your budget and leave you with no pleasure from the game. To avoid exhausting your budget, every player should learn how to quit the game, no matter if they are winning or losing. As a matter of fact, if you experience losses on the first four spins of the wheel, better put an end to your betting session. Even the amateur player knows that it is hard to beat the house edge, but one should make the best of it. Depending on the variation of the game, it should be noted that the house edge is different for American and European roulette. In fact, the European and French tables share the same house edge of 2.70%, while the American table offers 5.26% due to the presence of two zero-numbered pockets. The other crucial thing, which directly affects your cash is the betting limits of the table. Every table has its own requirements, when it comes to betting limits. These are usually noted on a special plaque of the table, so that each bet complies with these regulations. Some tables have minimum bets which could be as low as $5, while others have considerably higher minimum limits. It depends on your personal choice and the money, which you are willing to lose. Usually, players feel more comfortable at the lower limit tables. Consequently, to manage money and risk appropriately, one should always look to play at a table that offers the French style. In that way, you will decrease the amount of money you will pay for the casino profit. Every seasoned player should have a plan, when the game starts. In roulette, there are 2 major strategies. To determine the best one for you is a matter of personal preferences and budget limits. One popular roulette strategy is known as the Martingale approach. This approach involves doubling your bet every time you lose so that you can regain the lost amount in one bet. For instance, if you lost $5 on one bet, you should bet $10 on your next bet. This type of betting approach specifically applies to those who are placing bets on either red, black, 1 to 18, or 19 to 36 (high-low). The problem with this strategy is that it is related to substantial sums of money and you cannot be sure that your luck will turn around. Keep in mind that the wheel has no memory! Some analysts believe that the best approach is positive betting. This technique involves doubling the bet after winning rather than after losing. It should be noted that it is only effective with small wagers, so that in case you lose, it will not be a substantial amount of money. 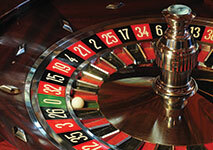 Bear in mind that roulette is a game that can be as quick as a single spin of the wheel. Players looking to prolong their gaming session should set their bankroll so that they can manage their money effectively with respect to the table limits and betting styles that are offered. The most essential thing is to control yourself no matter if you win or lose. Probably that is the most common advice, but also the most important. Do not be entrapped by taking revenge over the casino in case of losses or trying to hit life-changing sums when you experience a lucky streak. Casino games are for entertainment!